It is truly incredible all the different types of things you can frame these days and the variety of all the ideas you can think up! Save the memory of your christening or baby’s first christmas! Baby feet – how cute! Other unique gift ideas could be poems, love letters, or cards to a significant other. Was there a point in time where you had been separated from your lover and you two exchanged snail mail? Maybe a particularly sweet letter would be a great idea to commemorate by framing and hanging somewhere that you can see it everyday. Even a special photo collage could be made more personal by the choice of frame, the matting, and the colors. And if you decided to do any engraving or notation on the frame, that works great too! Was there a girl’s weekend away at the spa? Boys trip out camping in the mountains? Or maybe even a family reunion BBQ? Gathering a bunch of candid photo shots or posed group photos in a collage setting would be a great piece to give at the holidays or share at a family beach house. You can frame pretty much anything! 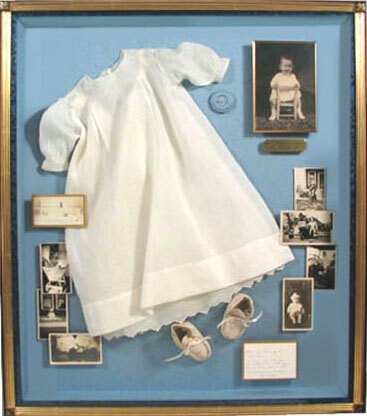 If there is a special keepsake you are holding onto, and it is definitely something you want for years to come, and is important to protect, framing is the way to go. How about these neat framed items below!? Framed memorabilia for a big fan! I recently moved into a new apartment and have a few bare walls I am looking to cover. I am quite confident that I can come up with some unique and interesting-looking wall decorations. Framed comics – A cool idea! Have you framed anything special to you? If so, what?